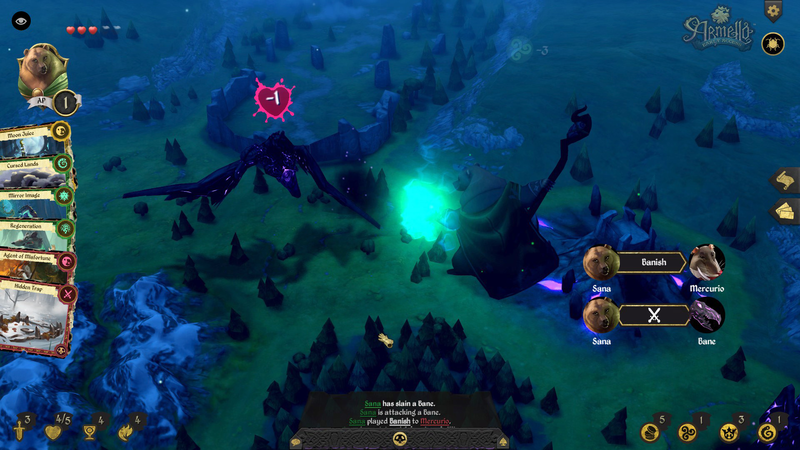 Earlier this month I gave brief coverage to the League of Geeks title Armello as part of my PAX Prime rounds. Today I find myself disappointed in that coverage, as my available hands-on time with the title pre-release, and pre-write-up, did the game little justice. The intricacies involved in the design, story, and execution of the Armello experience, to me, deserve more than a cursory glance. Since the write-up, the game has left Steam Early Access and the full version has become available for everyone. After a few weeks with the game, I'm hopeful that I'm able to give Armello the thorough coverage that it demands. "It's like Game of Thrones, only everyone is a fluffy animal," League of Geeks founder and director Trent Kusters told me at PAX, and I think this was a mistake. 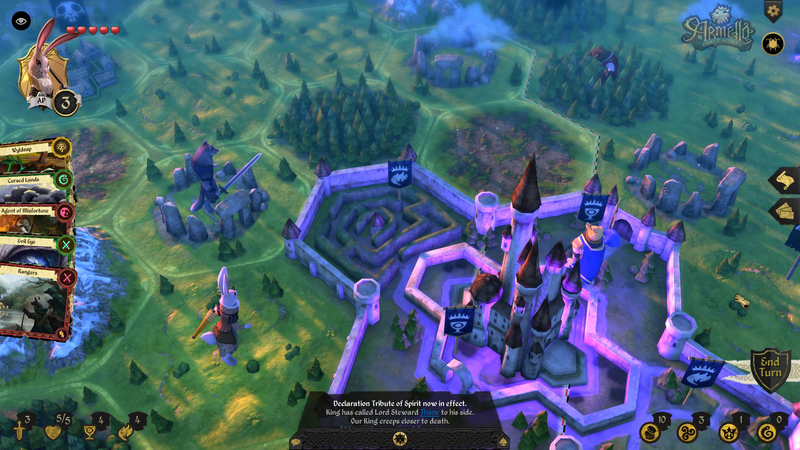 While on the surface the two stories may bear some similarities, the comparison of Armello to a series with such a massive fandom (not always for the best) undersold the uniqueness of the game, which is more than capable of standing on its own. Growing up, my brother and I used to play the Sega Genesis version of Clue when we weren't playing other, cooler games. Digital board games have always had a special place in my heart because they merged the familiarity, challenge, and togetherness of a tabletop experience with my favorite thing ever at that time - video games. So right off the bat, Armello tickled my nostalgia bone. 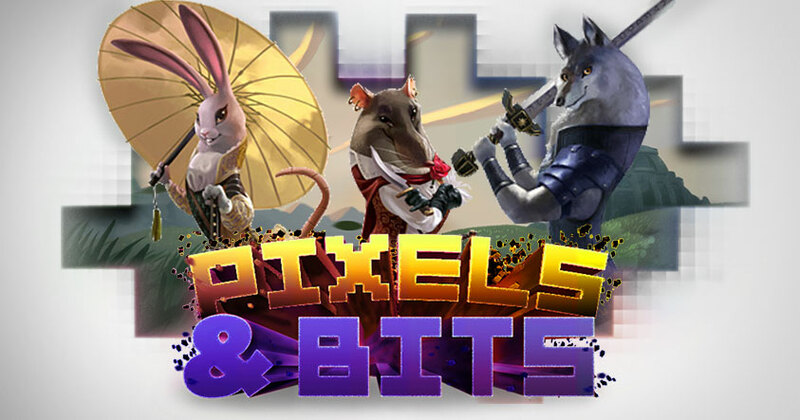 Armello is a stunning, clever, and downright charming Shakespearean saga that merges lush lore and fantastical heroes with the coveted feature of player choice. The game serves as a love letter to traditional tabletop gaming with improvements, combining equal parts board game, card game, and tactical RPG into one cohesive experience. 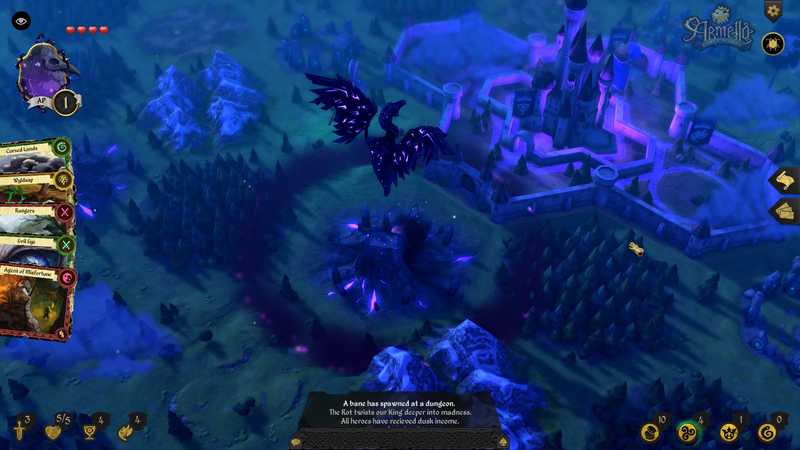 Each game of Armello begins the same: both the kingdom of Armello and the present King have been corrupted by a mysterious force known as the Rot. The Rot causes the King to go mad, summoning demons called Banes to cause chaos across the land. 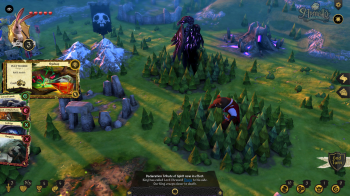 Armello is a Grimm Fairy Tale come to life, with cute and fluffy animals assuming the roles of treacherous plotters with one ultimate goal: take out the King and rule in his stead. Armello features eight playable characters to choose from, two characters from each animal clan: Thane and River from the Wolf Clan, Sana and Brun of the Bear Clan, Mercurio and Zosha representing the Rat Clan, and Barnaby and Amber round out the cast as the entries from the Rabbit Clan. Each character has a unique and distinctive set of abilities, and disadvantages, that accompany them on their quest, and each clan provides specific bonuses, as well as different bonus add-ons during player selection. Each character can equip one ring and one medallion - the effects of the ring change depending on clan, while the medallion adds bonus points and stays the same regardless of what character is selected. Every game, four of these anthropomorphic heroes (antiheroes?) navigate a hexagonal board, through both day and night. Each turn a player has 3 AP to use in order to navigate through randomly generated tiles. A forest tile grants stealth at night, a swamp depletes one health, stone circles replenish one health, dungeons can be explored, settlements can be claimed, and mountains can be climbed. Each tile requires one AP to move to, with the exception of mountains, which require two but also grant additional defense if attacked. 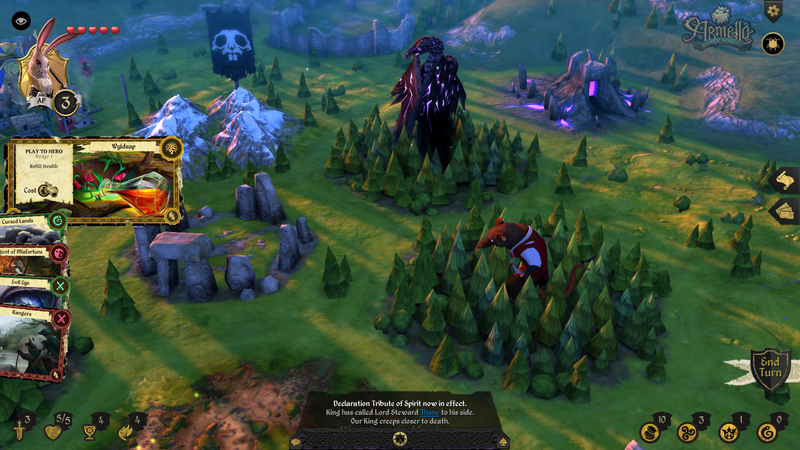 Winning Armello is a feat that can be achieved in a number of ways. While building enough strength to kill the current King in battle is an obvious method and results in a Kingslayer victory, a player can also pursue a win more subtlely. A player can choose to corrupt themselves with evil magic, eventually assuming the role of ruler by becoming more corrupt than the King and defeating him, thus completing a Corruption win. The player can also opt to collect spirit stones, which appear across the board and can be used to cleanse the King of corruption and vanquish him, satisfying the requirements for a Spirit victory. 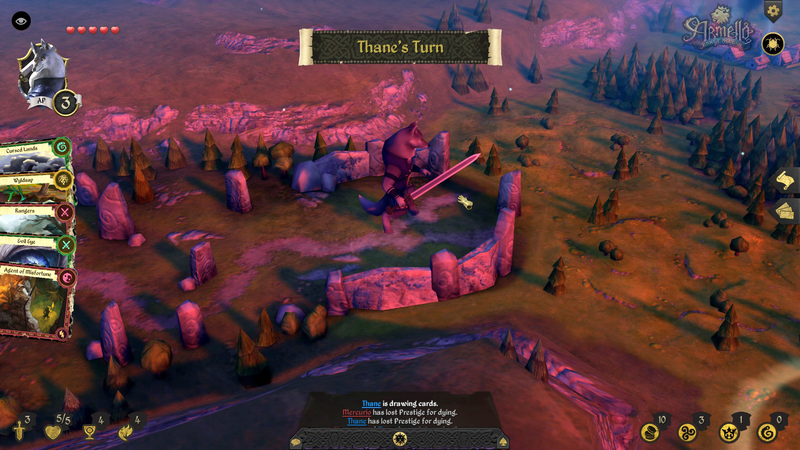 Armello also employs a Prestige system, with Prestige amounts able to be built by killing other heroes, defeating Banes, and completing quests. At the start of each day the player with the highest level of Prestige can use their influence in order to impact the King's decisions. Having the highest amount of Prestige results in - you guessed it - a Prestige win. If another character successfully kills the King, but also dies while doing so, the player with the highest Prestige wins by default. Players have to divide their attention between battling each other, battling threats, and playing towards a win. 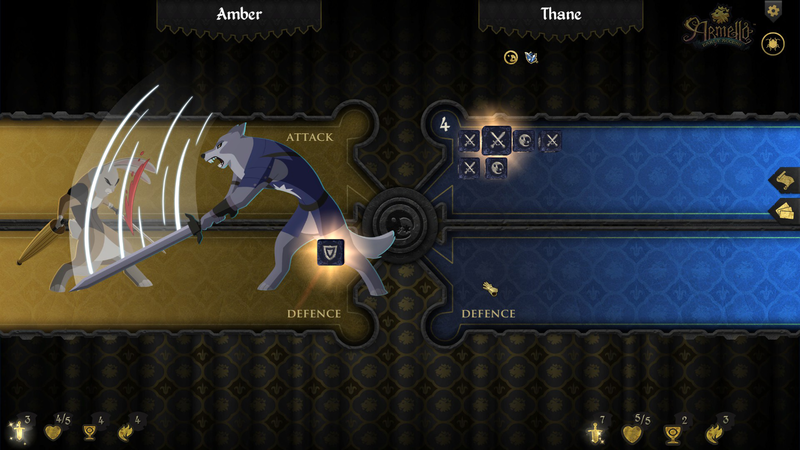 Combat in Armello is dice based, and there is a nice randomization to the rolls that doesn't appear to favor any particular player - this remained true even when playing matches against the computer. 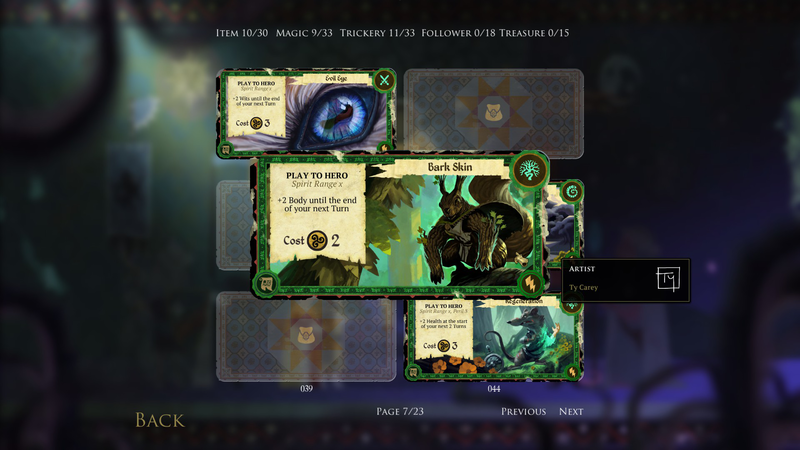 Armello also features over 120 fully animated cards, which come in several forms: NPC allies, tricks, weapons, and spells. There are four "currencies" used in the game: Gold is used to play ally, weapon, and trick cards, while Magic is necessary to play spell cards. Prestige is used in order to increase political influence, and Rot is reflective of a player's evil and corruption. Armello is a game clearly intended to play with other human beings. Although single player is offered and pits you against the computer, there is a major element of challenge removed. I played roughly ten single player games and every time, all of the computer characters attempted Kingslayer wins. There was no brutal Prestige war or a race to get to the Spirit Stone that had just appeared. While it was useful for unlocking items that can be equipped at the start of a match, it was pretty dull. 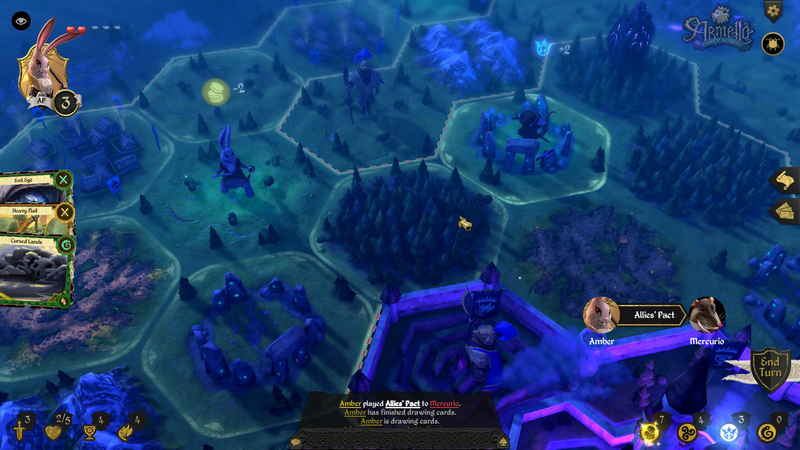 Armello is a tale of neither good nor evil, but rather the varying degrees of grey that make up the space between. You are given the ability to select your play style, and the way you choose to attempt to win. My sole complaints are with the limitation of player interaction, the single-mindedness of the computer, and concerns that the game could become stale after time - a point that could be remedied with content upgrades. In general, my time with Armello was a special experience, and I can see myself enjoying the game for quite some time. 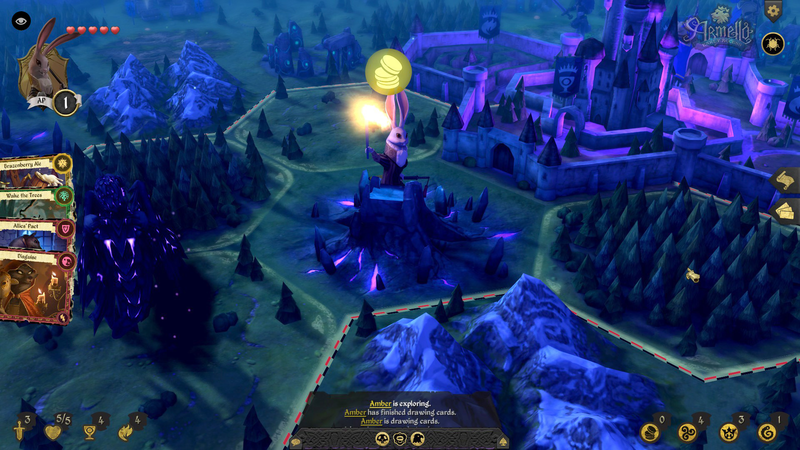 Armello doesn't completely replicate the feeling of tabletop games, but it's a great alternative when playing with friends who may be long distance, with strangers, or alone. The spirit of tabletop gaming is there, even if the table isn't. A copy of this game was provided by the developer.